Designing a website takes much more than knowing some basic code and having a good idea. 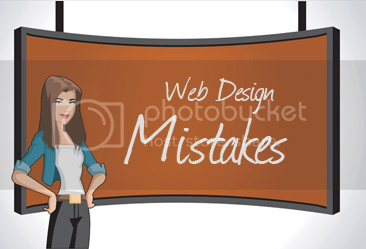 With the number of people who have been trying their hand in web design it seemed like a good idea to list some of the more common designer mistakes, as a sort of a beginners guide dealing with what you should avoid doing in your pet project. First of all, you shouldn’t be overconfident. When you take into account the fact that whether your site looks nice or not is very subjective, it might be easy for you to simply convince yourself that you have done a great job and move on. Even though it might be quite a blow to one’s vanity, ask for honest critique and always strive to improve. This actually touches on another point; there is a current in web design of people who highly value simplicity and minimalism. While such websites might look great, just because what you’re seeing looks quite reduced and straightforward, doesn’t mean that there are not a lot of details there that you simply can’t notice. This is to say that you need to do a lot of work and devote a lot of attention even to a site which will end up looking fairly simple. Don’t be fooled into thinking that your work on a website has finished as soon as you got it working for the first time. Likewise, if you decide to take the minimalistic approach when it comes to the number of colors you’ll use on your site, be aware of the fact that while there are plenty great looking sites with just several shades of a single color, pulling that off requires some experience and talent. Just using one color is definitely not a surefire way to make a good looking website, if you don’t really know how to use that one color, feel free to mix in others as well. It is not surprising that most people will try to use as much *free stuff * in the building of their website as they can. However, there are some things that you shouldn’t be stingy about, primarily fonts and images. Sure, you can find a font that fit your needs perfectly, or a free image that doesn’t look too bad, but don’t dismiss paid ones right from the start, at least browse the offer and see if there is something that will probably not be too expensive and could make your site look much better than it would if you just took the first free image or font that you’ve found online. Finally, there’s the issue of space cluttering and alignment. You need to make sure that the content on your site is easy to view and arranged in a practical and eye-pleasing manner. A lot of people just make a centered column of text, without any semblance of organization or structure. Try to arrange your content into logical sections and don’t be afraid to play with alignment, size, and generally, organization of the way in which the content is presented to your visitors. Thanks very much! great tips. What Gear is Great to Accompany Working from Home?